Joe Farias (photo) Election Night Celebration! Join us to congratulate State Rep. Joe Farias on his re-election! This campaign season has been long and memorable. We've spent so many hours knocking thousands of doors and making thousands of phone calls. On Election Night, let's enjoy the fruits of our labor as the live reports roll in. Tuesday, November 4 from 6 p.m.- 9 p.m.
Agave Mexican Restaurant (San Antonio, TX)3302 Pleasanton Rd. Directions:From the Pleasanton/Military Drive intersection, travel south on Pleasanton. Agave will be on your left, right after you pass Vestal. Can you take a walk with us? Saturday and Sunday:10 a.m. – 2 p.m. – 4 p.m.
3p.m. – 7 p. m.
Tuesday: 7-10 p.m. – 11 p.m.-4 p.m.– 4 p.m. – 7 p.m. Please contact our field director Sarah Hanrahan at (210) 923-1100 or info@JoeFarias.com to set up a time to come and help re-elect Joe. All members are encouraged to donate professional attire for women. Please read the guidelines below. Dress for Success currently accepts new or nearly-new and cleaned: Coordinated, contemporary, interview-appropriate skirt and pant suits Beautiful, crisp blouses Gorgeous blazers and jackets Professional shoes We are particularly in need of larger-size suits and apparel. Members are also welcome to bring men's professional clothing. They will be received and given to a local charity. Shavano Park Business Association is inviting everyone to their 11th mixer of 2008. No cost to attend! Please join us to mix, mingle and meet new business partners, Wednesday, November 5th from 5:30 p.m. to 7:30 p.m.
Sketching in the Galleries: Now weekly! Our popular sketching class is now offered every Tuesday. November's artist is Ethel Shipton. 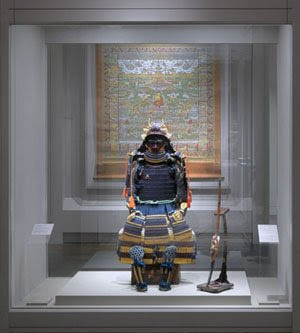 Thanks to the JPMorgan Chase Foundation, admission is free every Tuesday from 4 to 9 pm. News Conference @ 1:45 p.m. Sunday, November 2nd @ the Bexar Appraisal District Office, 411 N. Frio @ West Martin. Contact: Bob Martin @ 690-1660. Believe that I am able to do this? That’s the question Jesus is asking us all! Watch this weeks PASSION TV with Richard Boyd Click on Link now below! The Wurzbach Group hosted a candidates forum @ the Colonnade on Wurzbach Rd. Thursday, Oct. 30th. Participants included District Judge Joe F. Brown, State Rep. candidate John Garza, State Rep. candidate Frances Carnot, write-in candidate for Commissioner Pct. 3 Rhett Smith & Justice of the Peace, Pct. 2 candidate & former Balcones Heights Councilman Steve Walker. Chip Haass, Election Night Party @ Pericos @ 6 p.m.
Chip Haass would like to invite you to his Election Night Victory Party, Tuesday, Nov. 4th @ 6 p.m. @ Pericos, 1439 E. Sonterra Blvd. 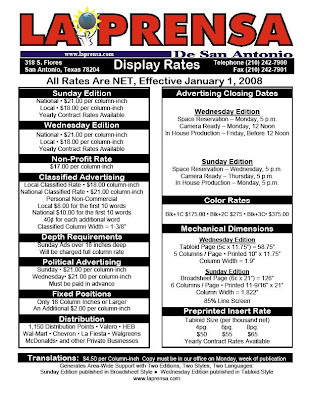 Sunday Edition, Local rates $18 per column inch. 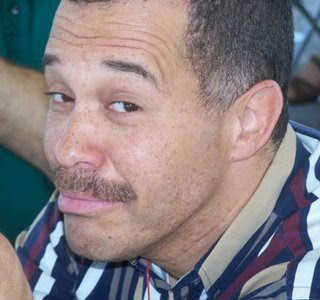 Call 242-7900 or Fax: 242-7901. La Prensa is located @ 318 S. Flores. Translations are $4.50 per column inch. Enlarge photo for detailed information. 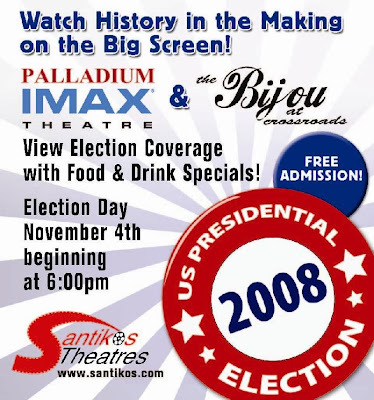 Watch Making History on the Big Screen @ the Bijou Theatre @ Crossroads Mall, Election Day, Tuesday, Nov. 4th beginning @ 6 p.m.
With Early Vote in full swing, Vote Walker, Walker, Walker! 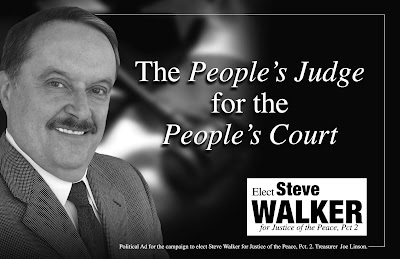 Early voting is nearly finished and it is not too late to vote for Steve Walker, candidate for Justice of the Peace, Pct. 2, Pl. 1! Event Sponsors: Orderup, John Hill/TechSage Solutions, J's Party Rentals & Supplies, The Walker Report and Luxor Insurance Services. Courtesy of the Walker Report/Steve Walker. You are invited to the 11th Latino Breakfast Club meeting of 2008.3rd Anniversary Breakfast!!! Networking with a Latino Flair! Parking Advice: There is an Extra parking lot to the right of the restaurant. We encourage you to use it if you arrive after 7:50 a.m. The Latino Breakfast Club is a Virtual Networking Organization. There are no membership dues, bureaucracy, committee assignments, organizational duties, or fees to pay. We are a grassroots alternative to the historic downtown chambers of commerce.Our sponsors include Cha Cha's Fine Mexican Cuisine, and The Hartford Insurance from Luxor Insurance Services. Ever wonder how successful women business owners made it to where they are today? Meet experts in five fields and learn from their experiences. 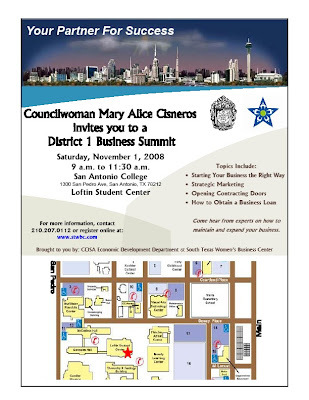 The South Texas Women’s Business Center (STWBC) is hosting this long awaited event, which is aimed for women business owners who are starting or expanding their business. Come listen to successful business woman who have lived through the trials and tribulations of starting their businesses. Attendees, bring your questions and experiences to share with peers. The roundtables will be led by selected women business owners in retail, construction, engineering, food and beauty. Debbie Treviño, President of Treco Janitorial Services, Pam Bain, M.A, President of Bain Medina Bain, Inc., Alicia Cendejas, Owner of Lisa’s Mexican Restaurant, and Julissa Carrielo, Owner of Tejas Premier Builders will be hosting the roundtables. Who: November 05, 2008 from 11:30 a.m. to 1:00 p.m. The STWBC is a program of the South Texas Business Fund, which is the non profit lending arm of the City of San Antonio’s Economic Development Department. The Center offers education, counseling, and training services to aspiring entrepreneurs and established business owners. For more information call: 207-0112. Socorro's Grill, 802 S. Alamo @ 8th Street, open Friday, Oct. 31st Halloween, doors open at 7 p.m. Congressman Ciro D. Rodriguez joined the San Antonio Firefighters Association in presenting patches to the 71st Battlefield Surveillance Brigade of the Texas National Guard, Wednesday, Oct. 29th at the Firefighters Association Hall.